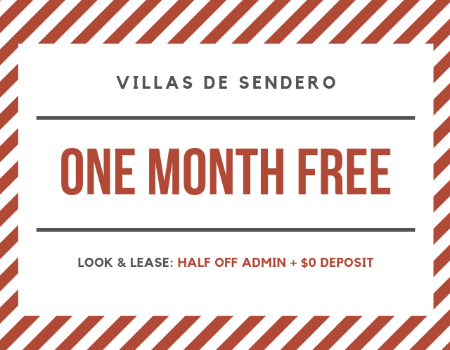 The most notable aspect of Villas de Sendero Apartments in San Antonio, Texas is its outstanding amenities. Not only are our apartment homes affordable, spacious, and accommodating, but residents will be able to experience what it is like to live in a community where you are the top priority. Choose from a studio, one, two, or three-bedroom floor plan where you can take advantage of our fully equipped kitchens with black appliances, spacious bedrooms, and unique touches such as faux wood flooring. If this isn’t enough to satisfy your needs, turn to our plethora of opportunities for outdoor recreation. Dive into our shimmering swimming pool with hot tub, meet with fellow residents (or professional staff members if you have any concerns) in our clubhouse, or treat your furry friend to a day out in our exclusive bark park. Come home to comfort, convenience, and charm!